When we believe something with faith —having been persuaded in our hearts by the Spirit of the truth— there remains no room for negotiation, compromise or variation. No one can talk us out of it, not even ourselves. Faith is belief that is experientially known within our hearts, as opposed to something to which we give mere intellectual agreement. When we believe something with faith, we have the “assurance of things hoped for and the conviction of things not seen” (Heb. 11:1). It is not something hoped for or that we wished to be true; it actually is! When this faith is pure (refined by fire), it will transform us effortlessly, resulting in the expected natural outflow of the fruit of the Holy Spirit. There is a problem, however. Not everything we believe with absolute certainty is the truth. Nonetheless, it is still our faith; but not a pure, refined faith. If we believe a lie with absolute certainty, it will transform us into its likeness, in the same way truth does. God clearly says in His Word that I am holy, but I do not always feel holy. He says I am loved and cherished, but this does not always feel true. He assures me I am cared for and all of my needs will be supplied and yet, I worry over my state of affairs. There is clearly a disconnection between what God has said concerning me (which is the truth) and how I feel and live my life. All of this (and more) comes back to belief. God wants me to know with absolute certainty the truth of who and what I am. He wants my belief to match the actual outcome of His redemption. He has already invested the price of His own Son to literally lift me out of the “… domain of darkness and has transferred me into the Kingdom of His Son”. He wants me to believe and experientially know this reality. Therefore, He is continually at work within me to bring this about. His present work is about the renewing of my mind so my belief might be transformed to match what already has been accomplished at the cross. To do this, He uses my life crises, troubles, and difficulties to expose what I believe, so that He may purify my faith. The Fire of Refinement Belongs to God. He is the Manager, the Flame. When I was in my early twenties, I worked in a steel mill in Northwest Indiana. I used to watch people bring raw iron ore in to be melted down and purified. The iron ore was placed into large vats and heated with fire to an extreme temperature. As the iron ore was melted down, the impurities would come to the surface as a dull and crusty slag. A person would then take a large tool and drag the slag off into a holding area, while allowing the molten steel to continue to heat. As more and more of the impurities were being removed, the molten iron ore would glow a golden yellow. After all the slag was removed, the steel was poured out into molds for later use. This is what God is doing in us. When he brings the fire into our lives, the impurities in our faith come to the surface. We can easily identify them by the way we feel in that moment. Fearfulness, anxiety, worry, dread, panic, helplessness, powerlessness, despair, feelings of abandonment, etc. are all signs of lie-based beliefs which are impurities in our faith. 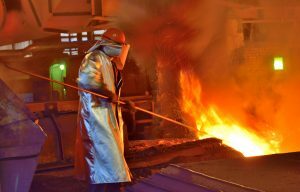 God wants us to submit to Him and allow Him to pull off the slag, so we will glow as molten steel, or better yet, as purified gold. Again, read how Peter describes this process where he wrote, “…do not be surprised at the fiery ordeal among you, which comes upon you for your testing, as though some strange thing were happening to you; but to the degree that you share the sufferings of Christ, keep on rejoicing, so that also, at the revelation of His glory, you may rejoice with exultation” (1 Pet. 4:12-13). Notice how we are to respond in the midst of the fire: he writes, “… keep on rejoicing, so that, at the revelation of His glory, you may rejoice with exultation.” How are we to rejoice in the midst of such unpleasant life experiences? The answer is found in the analogy of a person purifying gold. He has pulled off the dross or slag to the degree that the surface is glowing with mirror-like splendor. The refiner is looking into the molten gold and because of its purity, he is able to see his reflection in the gold. When the “revelation” (revealing) of His glory is reflected in us, we will rejoice with exultation! So in the midst of the fire, we can choose to rejoice in expectation of what is coming. When His glory is revealed in us, we will rejoice spontaneously, as this is the fruit of the Holy Spirit. Whether we realize it or not, we are in God’s refining program. If we belong to Him then this is what He is doing. It is not a question of whether you will go through the fire, for you will. It is only a question of whether you will choose to cooperate with God and benefit from it, or not. To the degree we understand the process and genuinely believe that it is good, we will be able to face each fire with the joy of expectation. James the Apostle tries to encourage us when he says, “Consider it all joy, my brethren, when you encounter various trials, knowing that the testing of your faith (refinement) produces endurance” (James 1:2-3). It is through the fire that our faith is made pure. Peter supports this principle when he writes, “…so that the proof of your faith, being more precious than gold which is perishable, even though tested by fire, may be found to result in praise and glory and honor at the revelation of Jesus Christ” (1 Pet. 1:7).